Here is a little bit about PBTR copied from the PBTR Website. Play by the Rules is governed by a national Management Committee, made up of partners from the sport and recreation and human rights agencies. It is a unique collaboration between the Australian Sports Commission, Australian Human Rights Commission, all state and territory departments of sport and recreation, all state and territory anti-discrimination and human rights agencies, the Office of the Children's Guardian (NSW), the Australian New Zealand Sports Law Association (ANZSLA) and the Anti-Discrimination Board of NSW. The following is from a recent mailout from PBTR and contains important information. See the link at the bottom of the page if you wish to subscribe to these mailouts. 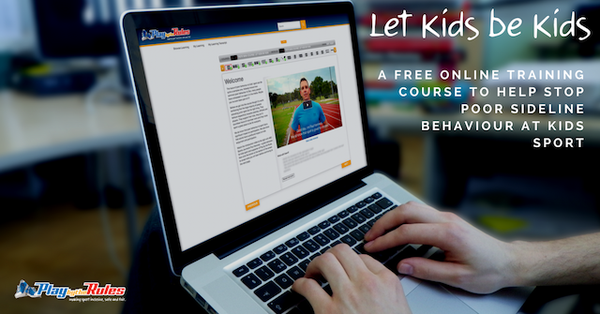 Thought you might be interested to know that we have just launched the Let Kids be Kids online mini-course. The mini-course is an extension of the hugely successful Let Kids be Kids campaign released last year addressing poor sideline behaviour at junior sport. It's a certificated mini-course so only takes about 30 minutes to complete. It features ABC journalist Paul Kennedy and is geared to providing some practical strategies to help you address the issues of poor sideline behaviour. If the success of the general campaign is anything to go by, then this mini-course is going to be very popular! PS: This is a great resource to share around your club or association - just link direct to the course page and people can register. Or share on social media.